Since opening its doors in 1930, the British Ambassador’s Residence has been considered the premier diplomatic address in Washington. A neoclassical English country house with influences from American Colonial architecture, the Residence was built when the great British architect Sir Edwin Lutyens was at the very peak of his powers. His only building in the United States, its majestic interiors, exteriors and gardens in the English style have been delighting Washington’s social and political elite for over eighty years. 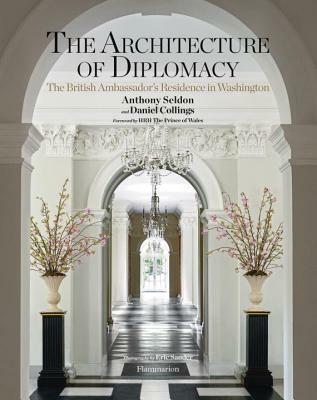 In this book, Anthony Seldon and Daniel Collings explore both the genius of Lutyens’ design for the Residence and the rich history of Anglo-American relations that has unfolded within its walls. The house and its extensive gardens are lavishly illustrated by specially commissioned photography, while striking images from the archives bring to life important events from its past. In 1939, the Residence bore witness to the first ever visit by a British monarch to the United States. King George VI and Queen Elizabeth hosted a garden party there, Washington’s social event of the decade, which was attended by the great and powerful of American politics, finance and high society. Through such prized events, and the skill of successive ambassadors, the building helped create and then embody the ‘special relationship’ between Great Britain and America. From Winston Churchill’s rambunctious visits during the Second World War to the dark days of Vietnam and the rejuvenation of the relationship during the Thatcher-Reagan period, the authors take the reader behind the elegant gates on Massachusetts Avenue deep into the corridors of power. This book offers an intimate and fascinating history, featuring previously untold stories of visiting royalty, presidents, prime ministers, and even the Beatles. ANTONY SELDON is a historian and one of Britain’s most distinguished political commentators. His published work includes the leading biographies of Gordon Brown, Tony Blair and John Major. DANIEL COLLINGS is a political historian and director of U.S. research for Margaret Thatcher’s authorized biography. He is based in Washington. ERIC SANDER’s photographs have been published in numerous magazines worldwide, including Smithsonian, Life, Time, Newsweek, Le Figaro Magazine and Point de Vue, and in more than fifteen books.